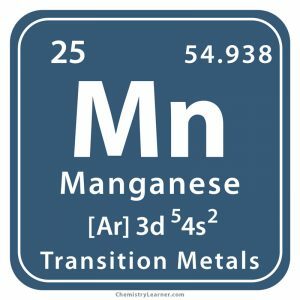 Manganese (pronunciation MAN-ge-nees ), represented by the chemical symbol or formula Mn , is a hard, brittle element belonging to the family of transition metals [1, 19]. Naturally occurring Mn has a single stable isotope with mass number 55 [1, 3]. Besides that, it has 21 synthetic isotopes with mass numbers ranging from 46 to 66 . Pure Mn reacts with water and dissolves in dilute acids. The powder burns in oxygen . Its minerals are widely distributed on the earth with rhodochrosite (manganese carbonate) and pyrolusite (manganese dioxide) being the most common ones. 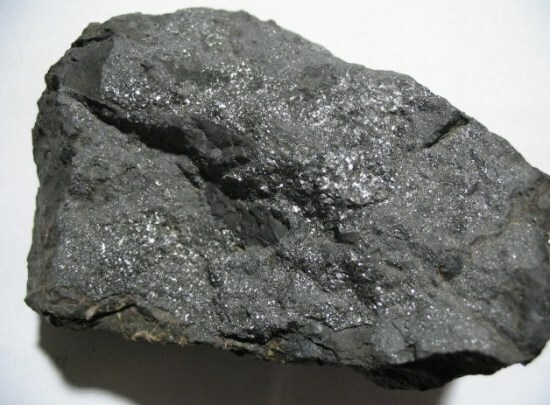 It is the fifth most abundant metal found in the earth’s crust. Manganese nodules that contain 24% Mn and smaller quantities of many other elements are found on ocean floors. Mn deposits and mines are in China (largest producer in the world ), India, Australia, Gabon, and Africa . Origin of Its Name: It might have been derived either from the Latin word ‘magnes’ meaning magnet, a name used to denote its compounds that were used in glass making or from ‘magnesia nigra’ indicating the black magnesium oxide in Latin [1, 3]. Who Discovered It: Swedish chemist and mineralogist, Johan Gottlieb Gahn [1, 2]. 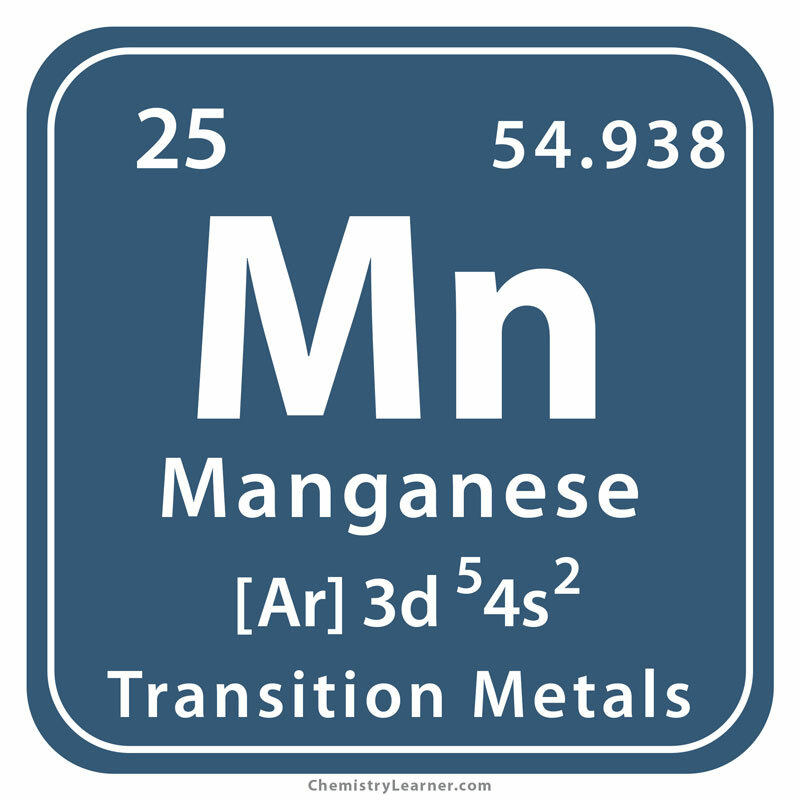 When Was Manganese Discovered: Its discovery year is 1774 . 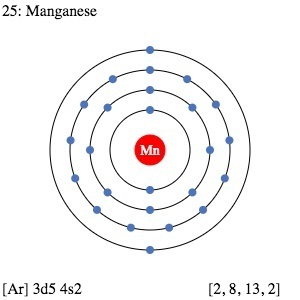 Manganese compounds have been used by mankind since ancient times. In 1740, Johann Heinrich Pott, a glass technologist of Berlin, chemically investigated pyrolusite and showed that it didn’t contain any iron as presumed in those days but a new earth metal. He could generate potassium permanganate, one of the strongest known oxidizing agents, from it. After several failed attempts to isolate the metallic component of the mineral in the 1700s, Gahn successfully produced Mn in 1774 by heating pyrolusite in the presence of charcoal. However, Ignatius Kaim, a student at Vienna, had already described how he extracted the metal, albeit in an impure form, in his dissertation dated 1771 [1, 2, 3]. In the manufacture of steel. It is added to the alloy to increase its strength and durability. 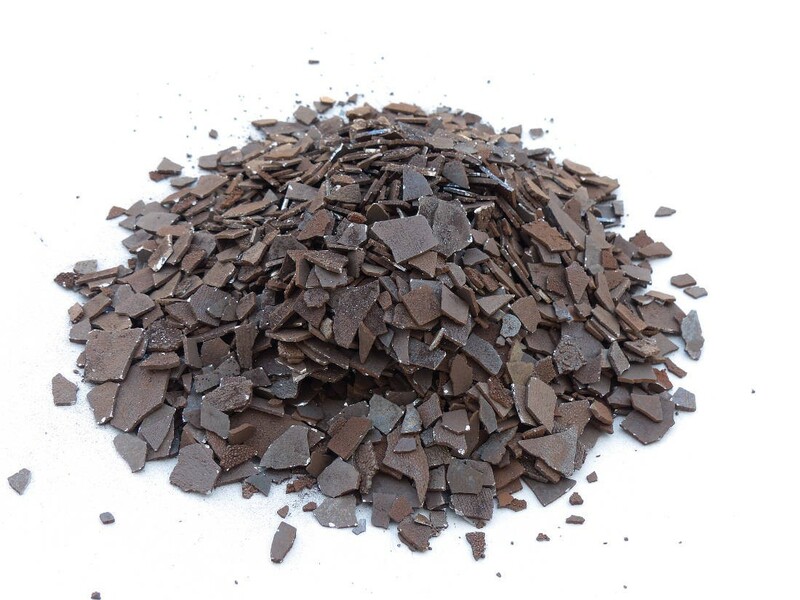 Manganese steel contains a greater percentage of Mn, is extremely strong and used in making safes, prison bars, rifle barrels and railway tracks . Mn is added to aluminum alloys to increase their tensile strengths and corrosion resistance . They are used in making drink cans . 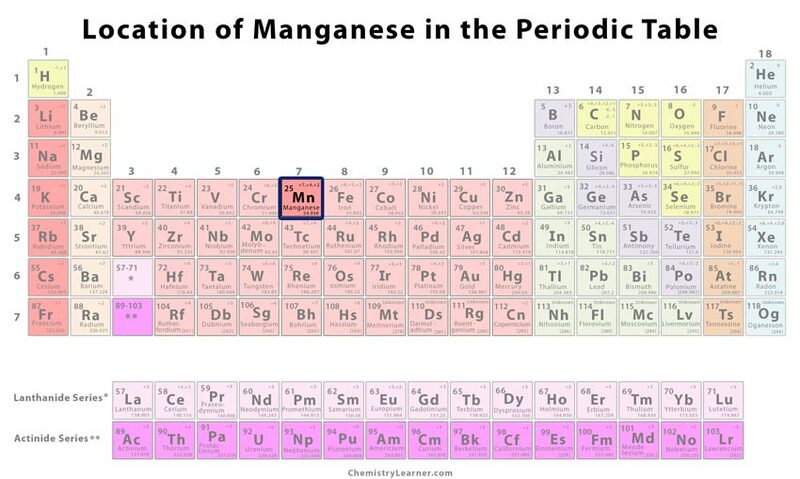 Though a tiny amount of it is required by us, manganese above a certain permissible limit can be hazardous . Hence it is important to regulate its levels in drinking water and food sources. Mn poisoning can lead to a permanent neurological disorder called manganism with facial muscle spasms, hallucination, violent behavior and tremors as symptoms, depression, anxiety, etc [11, 18]. Mn intoxication causes Parkinson’s disease and dementia . It is an essential element in all living organisms. The trace mineral supports vital functions of our body like the generation of digestive enzymes, bone and immune system development, nutrient absorption, etc and is good for your skin and hair. It also plays an important biological role by naturally balancing hormones, utilizing vitamin B1 and assisting carbohydrate and fat metabolism. Its deficiency can lead to osteoporosis, osteoarthritis, diabetes, weight loss, hair loss, etc [8, 9, 26]. Soils that have low levels of manganese require it to be added to fertilizers and given as a dietary supplement to grazing animals . It can treat inflammation, tendonitis, etc . The human body contains around 12 milligrams of the metal on an average. The RDA (recommended dietary allowance) is about 4 milligrams per day. Wholegrain cereals, parsley, tea, nuts and bran are foods high in manganese. Mn is an essential micronutrient for plants where it majorly contributes to respiration, photosynthesis and nitrogen assimilation [1, 12]. High-performance lithium-ion manganese batteries using Mn as the cathode material are a breakthrough in technology . 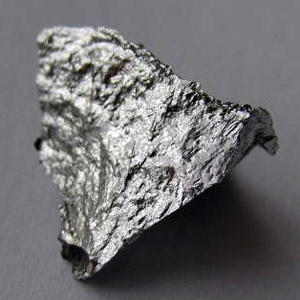 In spite of the origin of its name, manganese is not magnetic ! 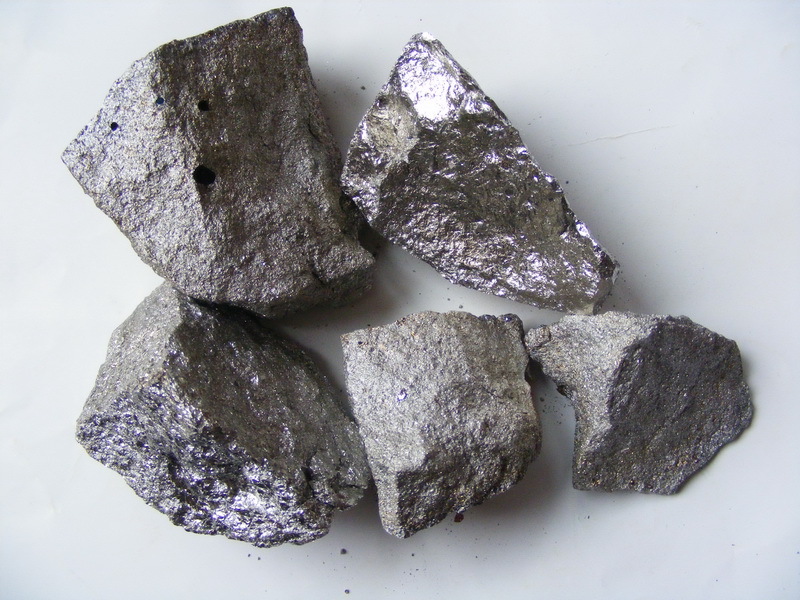 The pure metal is priced at $6.5 for every 100 gram and in bulk, the same quantity costs $0.28 .